Bag/Case - New Rolling Bag Design features durable rubber wheels, telescoping pull handle, stylish black & red padded nylon material with heavy duty zippers. This Item is a special order - please allow 5-7 Days! Bag/Case - Durable Rolling Compartmentalized Bag New Rolling Bag Design features durable rubber wheels, telescoping pull handle, stylish black & red padded nylon material with heavy duty zippers. CONSTRUCTION: Braces are 1/8" aluminum riveted to aluminum resonators. END FRAMES: The frame is made of solid wood and painted to a black finish. The end supports are made of steel tubing and fold for transport. Size: High End 13-1/4" wide, Low End 21-1/2" wide, 45-1/4" long. The M41 is height adjustable from 32-1/2" to 37-3/8" tall. The total weight is approximately 50 lbs. The Classic,with 11⁄4 inch tubes and durable,baked-on frame finish, is ideal for school use. Tubes are seamless brass and feature hardened caps for greater resonance and volume. The dependable damper system employs 100% wool felt. Supplied with rawhide mallet and detachable holder. Classic Chimes are mounted on a gold or silver vein frame with satin finished brass or chrome plated tubes. 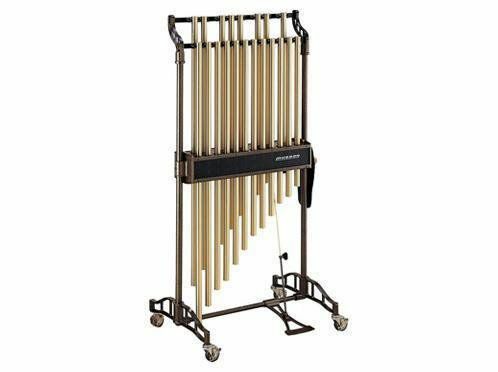 Chimes are easy to transport with a selection of concert frames and carts. Standard concert frames have locking casters. Ideal for the marching field, the All-Terrain Cart features 10 inch pneumatic wheels and front swivel wheels to provide smooth transport over rough terrain. The cart is made of 11⁄8 inch square steel. The 3-octave Combo® Vibe produces exceptional sound and performance for students at a scaled down cost. Silver burnished aluminum bars are carefully tuned, and aluminum resonators are finished with silver powder coat for durability and scratch resistance. Other features include a tension adjustable damper bar and a dependable 3 speed motor. 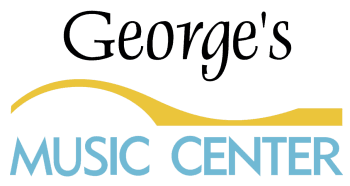 The height adjustable wood concert frame has folding aluminum legs for easy transport. 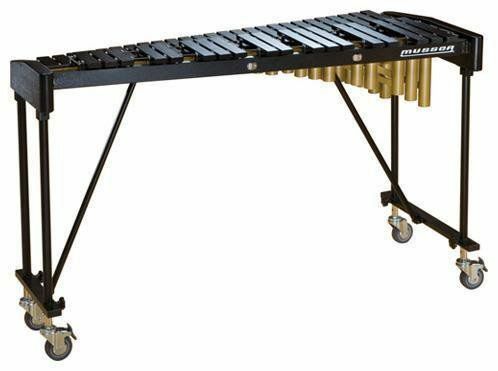 The Combo® vibraphone with the Moto Cart is made of heavy-gauge 2-inch square black-finished steel and is braced for rugged applications. 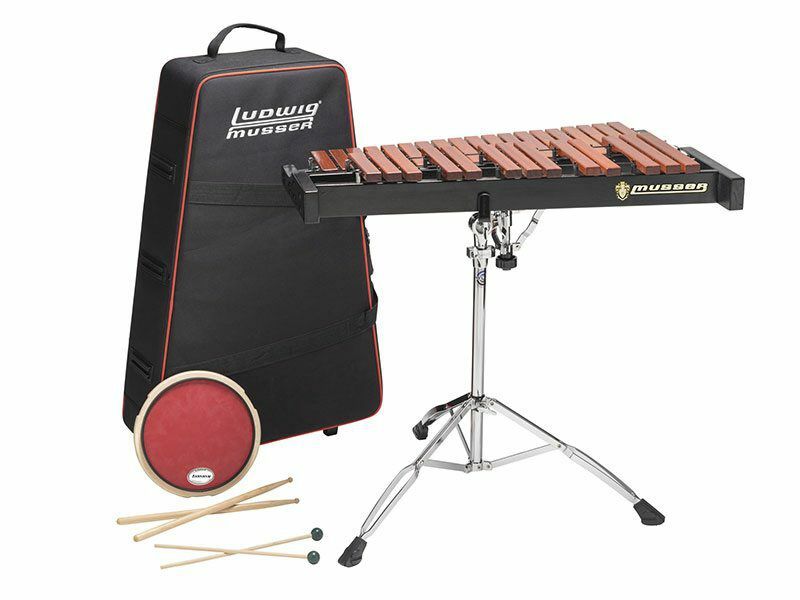 Introducing the new Musser M3PM 3 Octave Practice Marimba. "If it is 3PM ....... then it is time to practice!" Great Musser quality of sound without the resonators. Full 4 graduations of bars of Padauk wood for real playing experience. 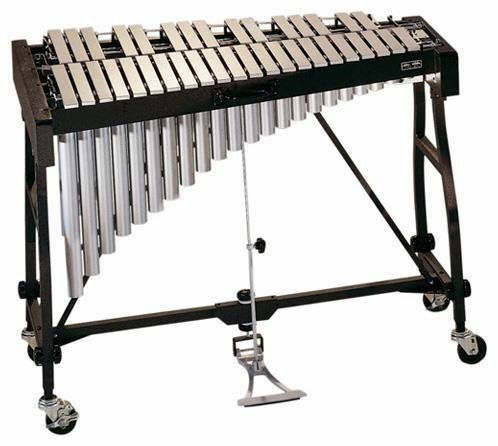 Instrument with bars already attached and assembled, x-stand, cover and mallets all in one box and ready for immediate set up and playing. Frame built so that the M3PM can stand on its' side and be kept out of the way against a wall to save space. Also the instrument can be slid under a bed for space savings. 'Reversed Post' technology on the bumpers so that the bars will not fall off when tipped on side. Weight of instrument is at 34 pounds - 12 pounds lighter than competition. Can be shipped UPS but it is oversized and gets an extra charge. 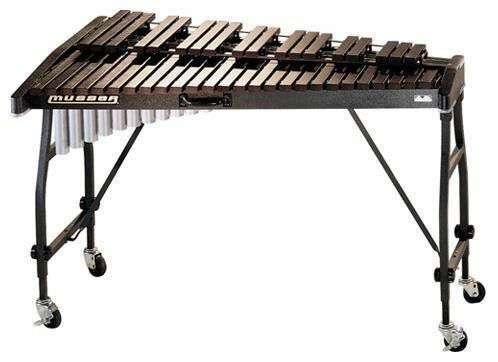 The Pro-Portable xylophone features Musser exclusive Kelon® bars which resist changes in temperature and humidity to maintain tonal quality and dynamic response. 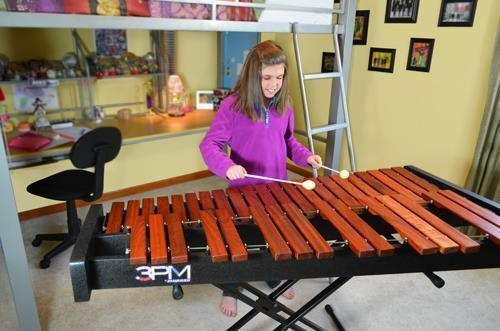 The 3.5- octave xylophone has silver powder coated seamless aluminum resonators.With excellent portability features, the xylophone adapts to any environment. 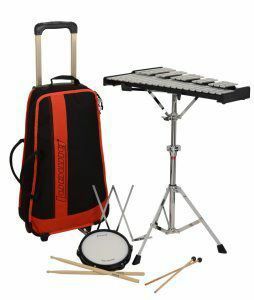 Detachable resonators and folding aluminum legs on the wood concert frame make it easy to transport. 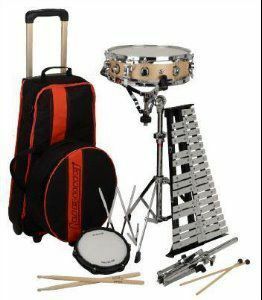 The Pro-Portable xylophone is also available with the Moto Cart frame or the All-Terrain Cart.